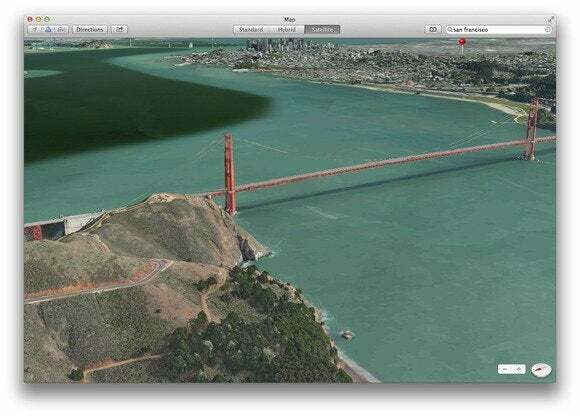 When Apple released Mavericks, some people were puzzled by the inclusion of the Maps application. After all, it’s easy to understand the value of having an interactive map on a mobile device: You always want to know where you are when you’re on the go. But given that our computers already have access to perhaps the best mapping service (and mapping data) on the planet—in the form of Google Maps running in a Web browser—what’s the point of Maps on the Mac? I can think of several reasons. The Maps application is the tip of what may be a far more important iceberg: integration. Map data is about more than simply providing pretty pictures in a single application. It’s also a way of providing location information in other apps. When you create an event and add a location in the latest version of Calendar, for example, that app will automatically search for said location; if it finds it, it will display a small map at the bottom of the event’s Edit window, with a red pin marking the spot and the current weather there. 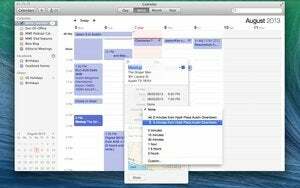 If you click in the Add Alert, Repeat, or Travel Time area and then click on the Travel Time entry, Calendar displays the time it'll take to travel to your destination—all using information supplied by Mavericks's built-in maps technology. Right-click to see a thumbnail map of an appointment location. You can also select an event that has a location attached to it, press Command-I to bring up the Info window, Control-click (right-click) on the address, and choose Show Address from the contextual menu that appears. A small map appears that details that location. From within this map you can choose to view this location in the Maps app, click a button to view directions to this location within Maps, create a contact based on this address, or add it to an existing contact. Safari offers a similar feature: Select an address on a webpage, Control-click (right-click) on it, and choose Look Up [nameofaddress], and that same small map appears with the same options. Ditto in Contacts: When you hover your cursor over a street address, a gray Show Map link appears. Click that link, and Maps launches and drops a pin on the location. These are just the Maps-powered features that Apple has added to its own apps. Maps (and its data) is open to third-parties. Any application—including those that deal in reminders, appointments, scheduling, local shopping and services, social media, and, of course, navigation—could put this information to good use. Maps also provides you with plenty of ways to share maps. In the Maps toolbar, click on the Share icon and you’ll spy any iOS devices running iOS 7 that are associated with your Apple ID. Choose one, and the Maps data you're currently viewing—a location or a set of directions—is sent to that device, where it appears as a notification. Tap that notification, and the mobile version of Maps opens on the device and displays the information. Easily share directions with an iOS device. From this same menu you can share this data via email, Messages, Twitter, or Facebook. Use either Google or Apple’s Maps, and you’ll see the expected roads and overhead views. As you zoom in on either you'll additionally see points of interest—restaurants, service stations, businesses, parks, and museums. Click on one of these locations and, most of the time, some kind of information window appears. In the case of Apple’s Maps, a flag appears providing the name of the location and, if one’s available, a Yelp rating along with the number of reviews the location has received. Google Maps shows business ratings, too. But in my experience, it doesn't rate as many businesses. And the ratings it does show are supplied by Google users only. Apple Maps, by comparison, shows ratings from Yelp—the de facto service for giving businesses the business. If you click the Info button in Apple's Maps, you'll get important information about the location including phone number, website URL, street address, reviews, and photos; Google Maps offers much the same. But there's a bit more in Apple's version. From within its window, you can add a location to Maps’ bookmarks, add it to your contacts, get directions, or send Apple a report that there’s a problem with the location (specifically that some information about it is incorrect). Some people might suggest that, given the unreliability of some of Apple’s mapping data, this last feature is an unfortunate necessity. Looking for a place to eat? Maps can help. Out of the box, Maps supports a 3D view, one where you can see certain locations from an overhead angle, allowing you to see how tall buildings and hills are. Now it's true that Google is currently previewing a new maps service that also offers 3D views, but that option isn’t available in Safari. Rather, you must be running a version of Google Chrome or Firefox that supports WebGL. 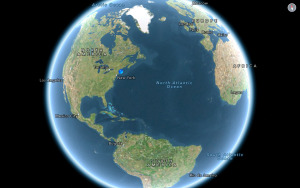 As a native application, Maps doesn’t depend on the whimsy of Web browsers to produce 3D scenes. It just works. So is Maps necessary? Purely as an exercise in finding out where something is located on this spinning jewel of ours, not really. We have plenty of other options. However, based on the way it channels location data to other applications, and considering the things that kind of location data allows those other apps to do, we’re just starting to see some of the intriguing possibilities.